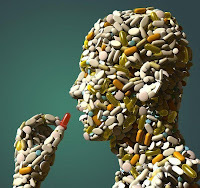 For governments and patients, the pharmaceutical industry has been both a curse and a blessing. The majority of “pharma sceptics” would nowadays argue that the industry used to be a trustworthy environment where innovative products automatically secured the confidence and demand of the public. However, whilst the productivity and quality of pharmaceutical innovation has steadily waned in recent years, the regulatory framework founded on the idea that all novel approved pharmaceutical products are efficacious and in-demand has hardly changed. Until very recently companies still enjoyed the unanimous trust of doctors and the passivity of patients, but has perhaps finally pushed its luck to the limits as it attempted to compensate for low productivity and spiralling research costs at the expense of the public. As the Rx market became less and less affordable for patients and governments, and as its ethical conduct became dubious, mistrust, suspicion and antipathy superseded simple conformity. 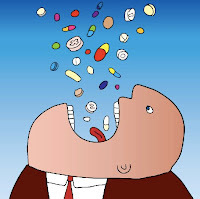 Seemingly, somewhere along the way the combination of capitalism and healthcare resulted in a raging war of corporate wealth versus public health, which left some patients wondering whether medicine, once so respectable, has become nothing more than a consumerist tool. 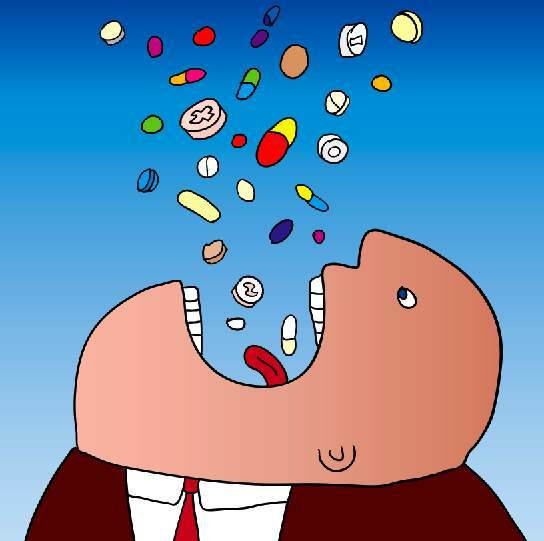 According to the Harris Poll of public opinion, already by 2006 the pharmaceutical industry in the US found itself at the bottom of the public trust ladder along with oil and tobacco companies; public trust last year stood at 11%, in contrast with 25% in 2006 and 60% in 1997. The majority of respondents, inclusive of stakeholders and patients, blamed the poor reputation of the industry on the shift in perceived motives from improving healthcare to maximizing financial success. Perhaps a number of highly publicized scandals, ranging from misrepresented indications and illegal marketing, to practices dangerously bordering on bribery, bear testimony to the fact that pharma has performed rather badly on the ethical front in recent years. Nonetheless, public mistrust has perhaps reached exaggerated levels: according to a report by PriceWaterCoopers titled, “Recapturing the Vision: Restoring Trust in the Pharmaceutical Industry by Translating Expectations into Actions,” two thirds of respondents grossly overestimated the percentage of the US healthcare budget allocated to medications (50-80% vs just 10% in reality), and underestimated by nearly 50% the costs of bringing a drug to market. Controversy aside, the figures alone paint an unsustainable picture: prescription medication cost the US government US$ 307 billion in 2010, accounting for 2.1% of GDP, in contrast with US$ 40 billion in 1990 when its portion of GDP was only 0.6%. Furthermore, amidst the patent cliff and health reform turmoil, 181 branded drugs in the US saw a whopping 8.7% price increase - the highest in the last decade, by far outstripping the inflation of 1.3% measured by the consumer price index, and in stark contrast with a 9% price drop of widely used generics (Fig. 1). 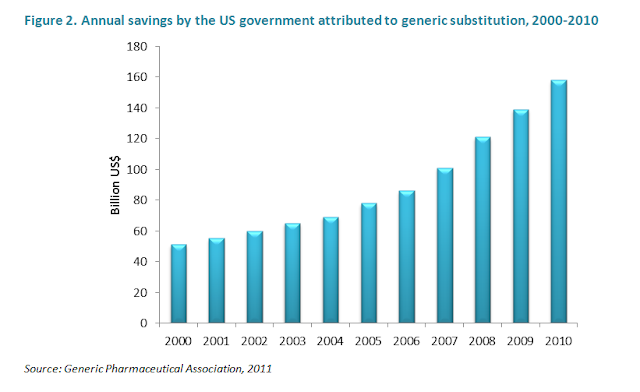 Most importantly, over the past 12 years, generic substitution has saved the US government a colossal US$ 1.031 trillion, with over US$ 200 billion saved owing to the patent cliff alone (Fig. 2). Benefits of such magnitude are not surprising: for instance, Erbitux, the antibody for colon cancer treatment distributed by ImClone, Bristol-Myers and Merck, costs US$ 17,000 a month per patient - and there are more expensive treatments on the market. Vertex Pharmaceutical’s new cystic fibrosis drug Kalydeco, for instance, costs US$ 294,000 a year per patient - treatment which even the best insurance could hardly cover. This begs the question whether such prices are really justified, and whether the patent cliff is a legitimate cause for celebration by pharma sceptics. According to drug companies, drug development costs today are more extortionate than ever, standing at over US$ 1 billion per compound, which is undoubtedly reflected in the high cost of prescription drugs. Table 1 shows a number of monthly consumer prices of common blockbusters in the US, where they are arguably the highest in the world. 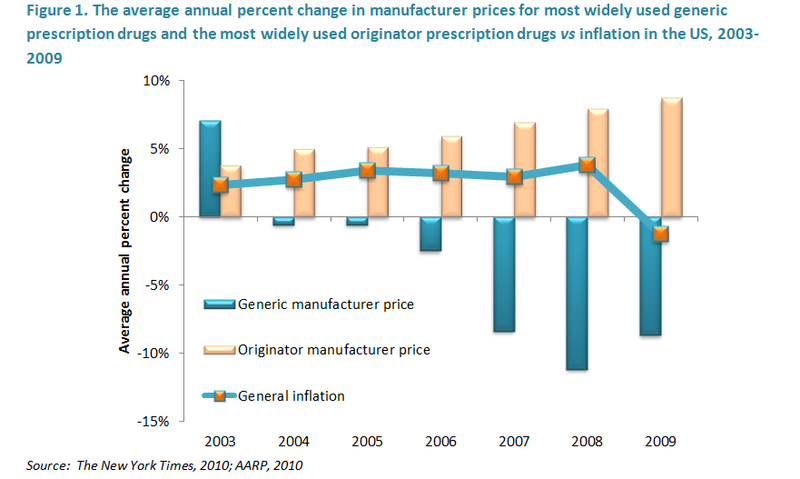 The prices of generic versions or equivalents of these drugs would range between 10-30% of the indicated costs. How are high drug prices determined and justified, and have drug companies been making excessive profits? The American Federation of Labour Congress of Industrial Organizations states that for every US$ 100 of a prescription drug’s price, 15% is for R&D costs, 26% is for manufacturing, executive and staff costs, 35% is for marketing and administrative costs, and 24% is net profit. Measuring the cost of intangible input (i.e. R&D) is an ambiguous practice - as the financial impact of failed compounds needs to be priced in to the cost of successful ones for the companies to operate. Taking the whole pipeline into account, a price-determining reagent becomes apparent: the productivity of R&D - which is, or theoretically should be, inversely proportional to medication costs. Thus, the higher the ratio of failed to successful compounds, the more financial compensation needs to take place via consumer prices. Considering the poor pipeline output of the past decade, it isn't surprising that prices have witnessed such a sharp rise. Crippling drug prices have a particularly dramatic effect in emerging economies where out-of-pocket payers constitute the majority of patients. Globally, pharmaceuticals account for nearly a fifth of all health spending, and payers on average pay four times more for branded medication where generic versions are available. In China, the brand premium reaches up to 13.2 times. According to recent WHO statistics, even generic medications are beyond the reach of many patients in middle- and low- income countries. On average, generic treatments cost over 2 days’ wages in half of the emerging markets studied, whilst originator medications would consume between 10 days’ and over 30 days’ salaries. In instances of chronic illness in low-income countries, treatment with branded medication becomes entirely unsustainable. 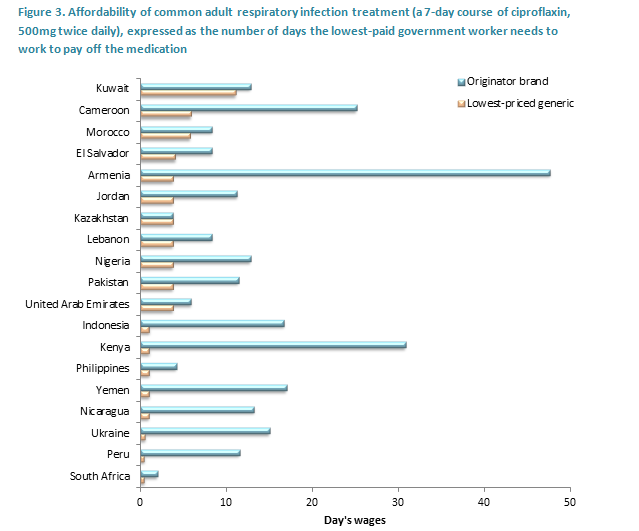 Figure 3 demonstrates the affordability of a course of antibiotics by country, exposing the harsh reality that it would take some patients up to 50 days of work to pay off just one course of branded medication. The immense rise of generics during the cliff presented governments with novel possibilities to re-budget healthcare systems by increasing generic uptake. Widespread legislation changes took place throughout Europe and the rest of the world in the wake of financial crisis, which took advantage of vast generification. The risk added by health reforms, and the imminent end of pharma’s honeymoon in the US were the main factors attributing to sharp price increases of medicines last year. New legislation almost inevitably leads to temperamental price spikes, but the picture appears gloomier for pharma this time around. In Europe, the industry has been the worst hit by pricing pressures. Amidst widespread austerity measures European governments are under more strain than ever to lower healthcare costs, and in this respect the patent cliff has been a great empowerment in negotiations with large pharma. European price cuts were triggered by Greece’s austerity measures, but EU governments commonly cross-reference to prices in other countries, which so far lead to an EU-wide pandemic of stringent savings in Spain, Portugal, Italy, France, Ireland, Denmark, Germany, Sweden and the United Kingdom (Table 2). In addition, an EU-wide sales tax of 1.6% will be imposed on the industry in 2012, 2013 and 2014. The UK National Health Service (NHS) instated a Pharmaceutical Price Regulation Scheme (PPRS) in 1957, and will be adopting a more stringent Value-Based-Pricing approach in 2014. France unveiled an austerity package which aims to cut €700 million over the next two years, mostly by slashing prices of branded and generic drugs. The French government also pledged to increase the time-frame of cost-benefit evaluations of new drugs in 2011. Germany, Europe’s largest drug market, introduced a benefit system in 2011 which requires all companies marketing new medication to provide proof of the drug’s superiority over other available treatments. According to BMI, this system, along with other measures, lead to savings of €1.9 billion in 2011, three times higher than the savings in 2010. In addition to a mandatory 7.5% discount on medication list prices, Spain has, in recent years, passed legislation enforcing savings altogether amounting to 23% on prescription medication and 25% on generics, which will amount up to US$ 2 billion. Sadly for the industry, the price-slashing pandemic hasn’t been confined to European borders: many of the emerging markets and, most notably, the major Rx market of Japan have all initiated healthcare savings in recent years. Healthcare expenditure in developing markets is on a steady increase, instigated by novel government regulations and a growing number of private insurers, which has led to a burgeoning focus on cost containment and on generic substitution. Japan exercises a bi-annual price cut system, with the next round of roughly US$ 7 billion savings anticipated in April of 2012. Furthermore, having previously boasted a notoriously low level of generic penetration, faced with a growing ageing population the Japanese government now aims to bring generic volume up to 30% by 2013 and onwards to new generic heights, which will inevitably stifle the growth of the pharma industry in Japan over the coming years. Meanwhile, South Korea uncovered plans of introducing 14% price cuts of pharma products, which sparked a protest rally of pharma CEOs and employees in Seoul. The Chinese pricing authority, the National Development and Reform Commission (NDRC) introduced tighter controls over the pricing of foreign pharmaceuticals in 2010, outlined in its New Methods and Regulations on Drug Prices protocol. Since 2011, 174 medicines ranging from antibiotics to heart medication marketed by Lilly, Merck, Novartis, Pfizer, Roche and Bristol-Myers saw an average price cut of 19%, generating savings of roughly US$ 300 million a year. It has been further rumoured that the country is aiming to adopt a pharmacoeconomic drug assessment model, and will make use of a price-referencing system with countries such as South Korea and India. In Russia, novel regulations unveiled in 2010 will allow the government to decide on maximum mark-up prices for drugs, and to slash prices that it believes are too high. All in all, the unsustainability of the pharmaceutical business model is affecting far greater layers of society than the industry itself. Government pricing pressures are further driving the model towards extinction. The fundamental truth which finally dawns upon Big Pharma is that payers can no longer compensate for lavish pipeline ethics, and this will inevitably serve to instil the notion of the importance of smart-cost drug development, which has for so long been overdue in the pharma world. 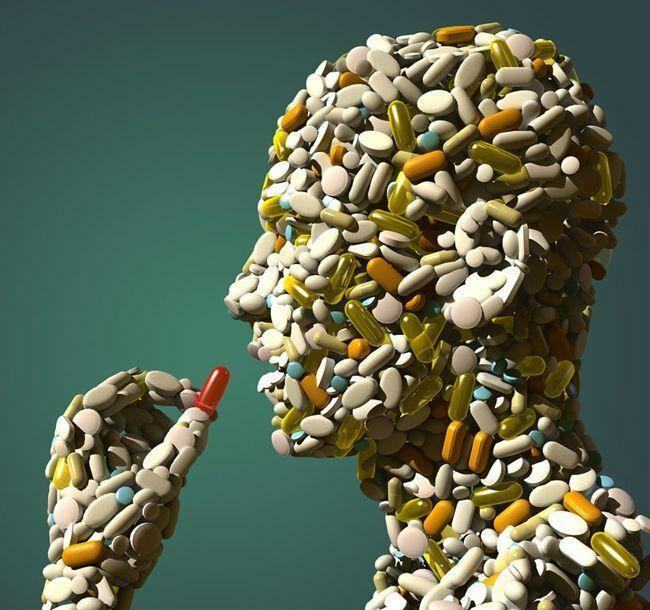 Stay put for our next post: The Pharma Industry and Public Trust Part 1: Medicalization and the Placebo Effect next week, and read about everything we cover in detail in Bioassociate's White Paper: "The Significance and Apparent Repercussions of the 2009-2015 Pharmaceutical Patent Cliff".